Easy prep, great taste, good nutrition and quick clean-up – what more could you want from a meal? This cookbook combines the best of all worlds! 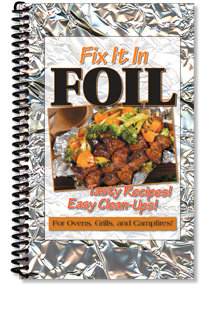 Featuring 51 fantastic recipes that each include instructions for cooking in an oven, over a campfire, or on an outdoor grill. With foil, meals can be wrapped ahead of time, frozen or refrigerated and then baked in the same package. You can prepare an entire family meal in one pack or assemble individual packs to suit different tastes. Then revel in your free time with the easiest clean-up of all – just crumple and toss!